Goody’s opened in Dillon on Wednesday morning at 214 Radford Boulevard, the former Peebles store in the Dillon Plaza. Anxious shoppers lined up waiting for the ribbon to be cut, and the doors to open to the new store where once inside they found quality, brand name apparel and accessories and a great selection of juniors and men’s apparel. Early birds–the first 150 shoppers–were rewarded with a free Goody’s tote bag. They also received sales fliers receiving a 15 percent discount as they entered the store. [slide] During the five-day grand opening from May 18-22, shoppers can earn $10 in bonus cash with every $50 purchase, register to win a $250 free gift card, and earn triple VIP points when they open and use their new Goody’s card during the grand opening sale. Shopper reward programs such as a membership discount for customers 50 and over, military discount and VIP Rewards membership are all available at the new Goody’s. 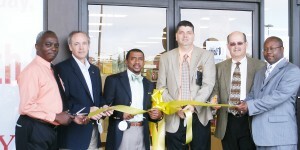 During the ribbon cutting ceremony, Mayor Todd Davis welcomed Goody’s, which he called a well-known retailer. He said he is looking forward to their success in Dillon. Davis also noted that they were working on getting the stores in the Dillon Plaza filled up. Kevin Thomas, chairman of the Dillon County Chamber of Commerce, said he was excited that Goody’s had located in Dillon and that the community was growing. Chris Morris, Dillon store manager, said it was a big day. He said Goody’s had over 500 stores nationwide, and they were excited about being in Dillon. Some of the members of the Goody’s team from out-of-town in attendance on Wednesday morning were Dave Zitzelberger, Mike Stablein, Edward Dunn, and Michael Johnson. Some of the local team members were Manager Chris Morris, Assistant Dillon Store Manager Frank McCormick, Janice Hardwick, Joyce Samuel, and Brenda Clements. For more information about Goody’s, visit www.goodysonline.com where one can sign up for e-alerts and money-saving offers.